Teazle joined our herd in March 2012. She has been a wonderful addition with her sweet, laid-back disposition and excellent conformation. She’s having a particularly good year this year – having increased her permanent L/A score to Excellent, and in progress on a very good 9th freshening as a 9-year-old. 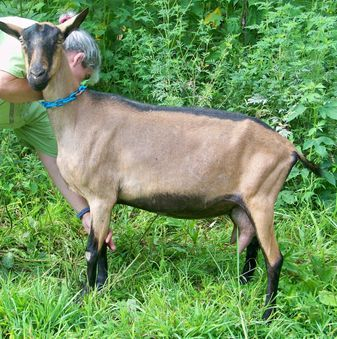 Teazle is a doe that just keeps getting better with age! Teazle did not get bred this fall. We may be retiring her. 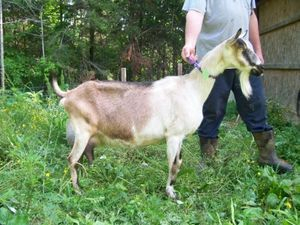 Jillian joined our herd in March 2011 as a yearling first-freshener. She was a slower-maturing doe, but well worth the wait. She has an outstanding udder, with the best rear udder height in the herd. She is AR and Superior Genetics. She is a reliable milker, and always shows up on time for the milkstand. She is the herd queen, with one of our stronger personalities. 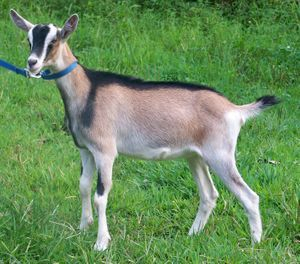 Jillian will be bred to Dobby this fall for June kids. Journey is a stunning doe, and we are enjoying watching her continue to grow and mature. She’s one of those does that catches your eye among the herd. Journey was our highest-scoring 2 year old at Appraisal and easily earned her milking star in 2016. She held her title, being the highest-scoring 4-year-old this year at Appraisal. 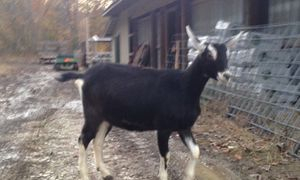 Journey will be bred to Distiller this fall for April kids. 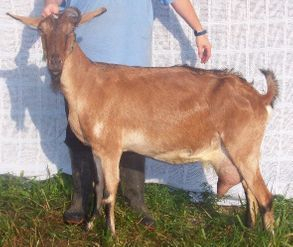 This is a repeat breeding that produced Jordynaire (see below). Jordyn is our first Distiller daughter, and we are just thrilled with her! She has been wide, deep, and growthy since birth. 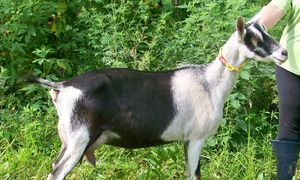 She also has a sweet, willing personality - something that's very important to us, as we work with these goats daily. We are looking forward to seeing her fresh. Jordyn is bred to Dobby for June kids. First doe will be retained. 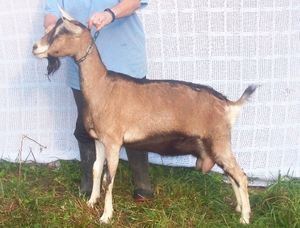 Jiselle is a repeat breeding that produced our stunning Journey. As much as we'd like to keep her, we need to make room for some Distiller and Dobby daughters. She is for sale. Jiselle is dry for 2019. Dakota may come from unregistered stock, but she’s a stand-out in our herd. She has been recorded as Native-on-Appearance. She produces more milk than any of our other does, and is the hardiest doe we have. She also tends to have the lowest SCC in the herd. Her dam also carried these awesome qualities, and we’re hoping Dakota passes them on to her daughters. Dakota easily earned her milk star as a 2-year-old, and made the Breed Leader list with her 2016 lactation for butterfat and protein. Her 2017 lactation lasted 600 days with almost 6,000 lbs produced! Dakota is bred to Distiller for late February kids. First doe will be retained. Dallas is the first daughter of our wonderful Dakota. As a first-freshener this year, Dallas is already the 3rd highest production doe in the herd. She is on track to earn her 2*M designation this year. Dakota, her dam, easily earned her milk star as a 2-year-old, and made the Breed Leader list with her 2016 lactation for butterfat and protein. Dallas will be bred to Dobby this fall for June kids. Dancer is a full genetic sister to Dallas. We are excited to see if she is as productive as her sister. So far her udder structure is an improvement over both her sister and her dam. I'd like to see a bit more capacity with a second freshening. But, she definitely has the will to milk, with a nice even lactation curve. Dancer will be bred to Dobby this fall for June kids.